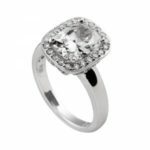 Each Diamonfire-zirconia stone is carefully set in sterling silver which is protected and perfected with a high-grade combination of platinum, palladium and rhodium. This three-metal plating guarantees that Diamonfire jewellery has long-lasting, tarnish-free protection and gives each piece a luxurious, polished look. Part of the allure of Diamonfire jewellery is the luxury silk-lined gift box in which it is presented, along with its own individual certificate of excellence. Diamonfire Cushion Cut Cocktail Ring has been successfully added to your shopping bag.